Know me for my abilities, not my disability - Gold Falcon Inc. Yes, I’m differently-able! My name is Hassan Ahmad. 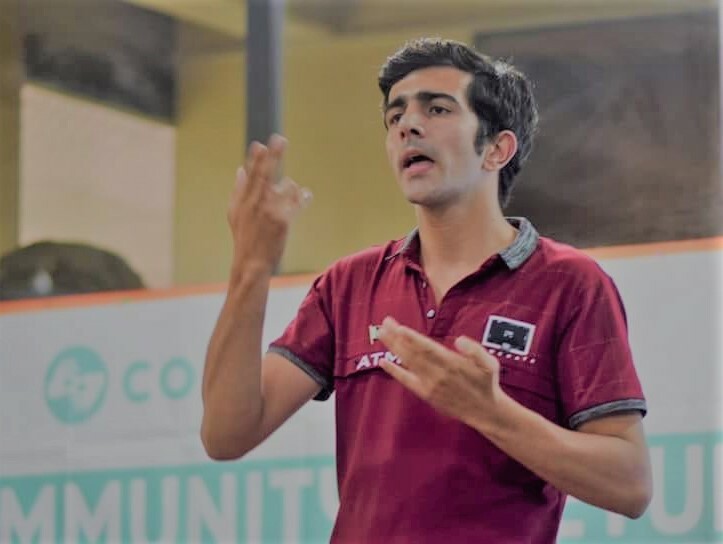 I am 23 years old, deaf and mute by birth belonging to a middle class family, from a small village of Rawalpindi in Pakistan, where deaf children are not encouraged to get the higher education. I was born with the disability of hearing impaired. My mother is also deaf and mute. But I’m the luckiest one, my parents worked very hard for my education. We were used to live in a small village of Rawalpindi. My father and my deaf mother decided to move in a city for my better education and successful future. ALLHAMDULLILAH after a very hard struggle of my family for many years, I done my bachelors in special education from Sir Syed School and College (Spl Edu) Rawalpindi. After graduating, I was very disappointed from the circumstances of our society and a myth was developed in our person with disabilities mind that they are not able to do job, they cannot earn by utilizing their skills. But with splendid support of my elder sister I decided to make my career in graphic designing. She really helped, encouraged and motivated me to do a graphic designing course. We both faced many challenges during the course, as many institutes were requesting my sister to sit with me in classes. Unfortunately, in Pakistan, we don’t have separate technical institute for deaf people where they can get technical or IT skills in Sign Language but I took the challenge to learn with other normal people with her much guidance. And I done Graphic Designing course from NICON institute. My GD teacher helped me a lot to complete this course. After completing that course I got opportunity to do internship in PTCL as a graphic designer Intern. My boss Sir Ather taught me the practically how graphic designer do work. Now I am doing a job in an IT company as a Graphic Designer. The main turning point of my life is when I got the opportunity to come at life changing platform which name as YLC (Young Leaders Conference). I attended YLC of this year 2018 with great efforts of PTCL Management. I was only one deaf with other normal young people. In start it was very hard for me to attend this conference. As there was no official sign language interpreter. But efforts from YLC team transformed my mind, gave me more power and courage to interact with normal people. I was very confused Before joining YLC and unable to communicate and talk to hearing people, because I always thought hearing people cannot response me good in sign language. But YLC was that turning point of my life which enabled me in every aspect of life. I just not survived and lived 6 days of life with other normal young people very first time without any interpreter support, which gave me more power to communicate with hearing people (if they don’t know the signs) also made me more confident and gave much exposure in matter of just 6 days. YLC team and my new friends really appreciated my differently abled skills. Even for a moment, I didn’t feel that I’m disabled. I learnt that “you are not disabled by the disabilities; you are able by the abilities you have”. A big Thanks to SOL for realizing me that ‘I’m differently-abled”.